Paguro Diesel Generator - 4KVA (Serviced Sept 2017 and new impeller fitted). Battery charging system from shore power and generator. Water pumps serviced and impellers renewed October 2018. Macerator & Deck Pump out for Holding Tank. Lift and hull jet washed November 2018. Lifted and hull washed April 2019. Hull and props to be polished; props coated, anodes to be replaced and boat to be antifouled. April/May 2019. New Upholstery to all seating including the main helm seating and also the bed headboards (BMW Vinyl Cream) fitted in 2016. All seating Re-trimmed. New mattress main cabin 2016. New Window Blinds fitted 2015. Ardic Cabin Heating, diesel powered warm air heater; also heats water when required. There is also a 20 litre calorifier with an immersion coil for hot water supply. Stern Thruster fitted in 2016 plus a side power remote that controls both the bow and stern thrusters. Garmin Echo Map 95SV - Colour Chart Plotter - New 2016. Garmin Echo 501C Fish Finder. 2 x Raymarine RL70C Colour Chart plotters one at each helm position; with Radar overlay. 2 x Simrad RS87 VHF DSC Radio handsets interfaced to GPS. Simrad A150 AIS Class B.
Rear View and Side Deck Cameras display at lower helm. 2 x Raymarine ST60 Tridata for Speed/Log & Depth. 4-Man Canister Liferaft - Requires Service. 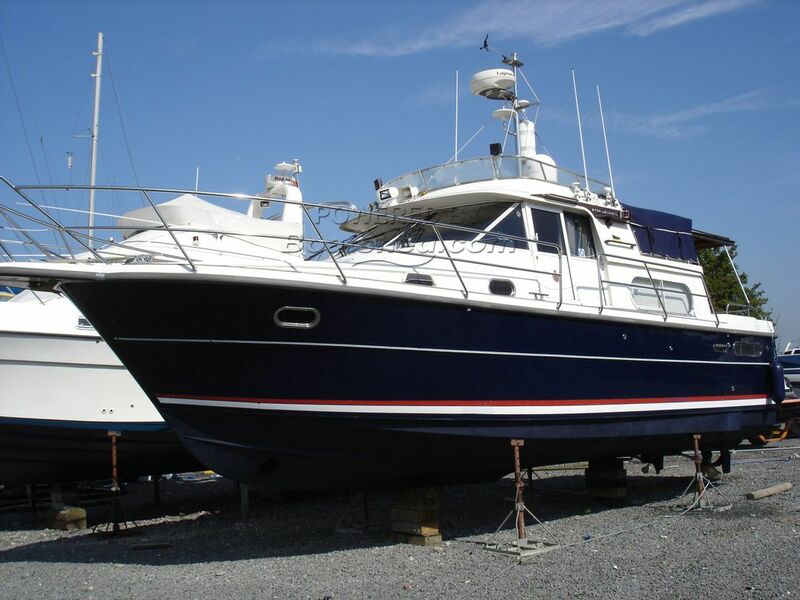 This Nimbus 380 Commander is very well equipped example of this quality motor yacht. It has two good sized double cabins forward of the main helm position. The aft cabin houses a saloon area and spacious galley. There is access to the flybridge via an inner companionway next to the helm and also via stairs from the aft cockpit. Recent additions to the inventory include a stern thruster with a side power remote to allow combined use with the bow thruster. New carpets, a second TV/DVD, window blinds and much more. This Nimbus 380 Commander has been personally photographed and viewed by Steve Booth of Boatshed Essex. Click here for contact details.